Little Portugal District San Diego | United Portuguese S.E.S. 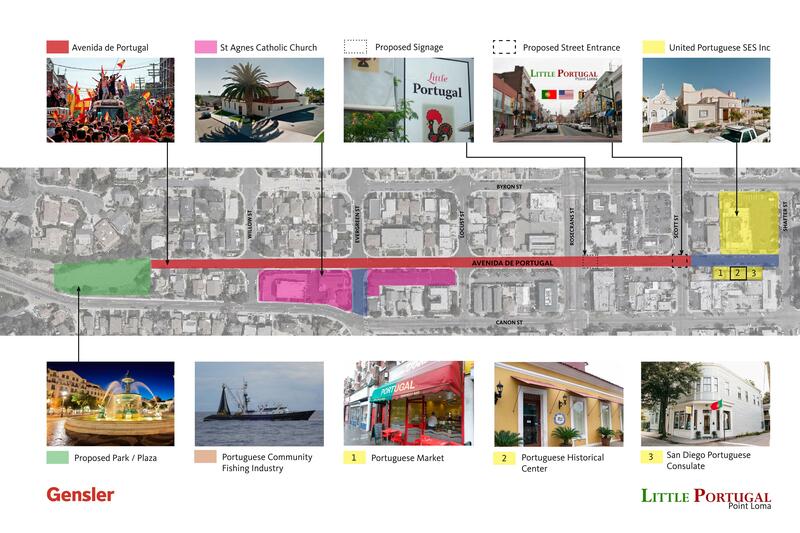 Inc.
We are officially in pursuit to form a LITTLE PORTUGAL Community Benefit District (CBD) right in the heart of Point Loma for everyone to enjoy, however, we can’t do it without your support. This new CBD would be formed under the local municipal enabling ordinance, the San Diego Maintenance Assessment District Law. We believe that you will find that New City America (NCA) has the most experience in similar CBD investigation and formation efforts and has the greatest experience in understanding the intricacies of managing these assessment districts in California today. This proposed Little Portugal CBD would be subject to the assessment ballot proceeding regulations found in Article XIII(d) in the California State constitution (Proposition 218). We are seeking your donations to hire New City America (NCA) to spearhead this project. NCA has developed over 70 CBD districts across the United States. They have the experience and city connections to make this vision a reality. This project is done in two phases, the Investigation Phase and the Formation Phase. 1. Invite area business and property owners to form a Little Portugal CBD Steering Committee. Review initial boundaries for the CBD study area with the Steering Committee; determine the scope of the investigation. Create database and investigate contacts for property owners within study area. 2. Agree to study boundaries with Little Portugal CBD Steering Committee, prepare a parcel map. 3. Create and distribute a Little Portugal CBD mailed written survey to property owners ascertaining conceptual support for special benefits district and priority of services within the designated study area. 4. Plot survey results on parcel map, identifying support and opposition by color. 5. Present survey results to the Little Portugal CBD Steering Committee, brief Councilwoman Lori Zapf’s office as needed. If support exists for the district formation, work with the Steering Committee and the Councilwoman’s office on preparing documents related to the CBD formation process. 6. At the conclusion of the investigation, the Little Portugal CBD Steering Committee will make the determination of conceptual weighted support exists for moving forward to the formation stage of the contract. If yes, set final boundaries of the district. Get approval of the CBD Steering Committee to work with the Mayor’s office and Councilwoman Zapf’s office to craft the process for the CBD formation to the City Council. 1. If instructed by the Steering Committee, write a newsletter summarizing the CBD survey results. Send out property verification forms to all affected property owners. Submit property database to the City for verification of database. 2. Write the first draft preliminary Little Portugal CBD Management District Plan, submit it to the CBD Steering Committee, meet frequently with Steering Committee until the plan has been fully supported. The Management District Plan is a legal document which will include the costs per property owner; list of special benefit services to be funded; benefit zones; (if any); frequency of services; boundaries; and management by a newly formed Little Portugal Property Owners Association. 3. Finalize the CBD Management District Plan; get approval from the Little Portugal CBD Steering Committee. Communicate with property owners on status of the district formation process. 4. Have the plan approved by an independent, city certified assessment engineer, (paid for by the City Councilwoman’s office). Once certified, have plan submitted to the Mayor’s office for review. Once City Attorney’s office has reviewed and approved the plan, initiate a petition drive to trigger the ballot, mail out plan summary to all property owners (need recommended minimum of 30% weighted support of property owners to endorse plan, based upon standard operating procedure for CBD ordinance). 5. Complete petition drive; submit petitions to the Mayor’s office. Brief Mayor’s office and Councilwoman Zapf’s office as necessary or instructed. 6. Update property owners on the progress of the formation effort. 7. Work with the City on ballot preparation, if necessary. 8. Follow up with Little Portugal CBD Steering Committee to ensure weighted majority of property owners vote and return ballots. 9. Attend public hearing, review the ballot counting. This is the total professional services quote to investigate and establish the Little Portugal CBD. Our goal is to have this complete for the 2017 calendar year. NO DONATION IS TOO SMALL! As a donor you will be recognized and also be part of an amazing historic creation here in San Diego. Anyone can donate to this cause and we greatly appreciate every donation. To donate, simply click on the Donate button and follow the prompts, ALL DONATIONS ARE APPRECIATED. Below is a sneak peek at what we have been working on for you to enjoy. Please spread the word! To get involved in this project or for more information please contact us at SDLittlePortugal@gmail.com.